Colorado, like many other states is full of rappers, and I’m sure we can all vouch that there’s no shortage either. 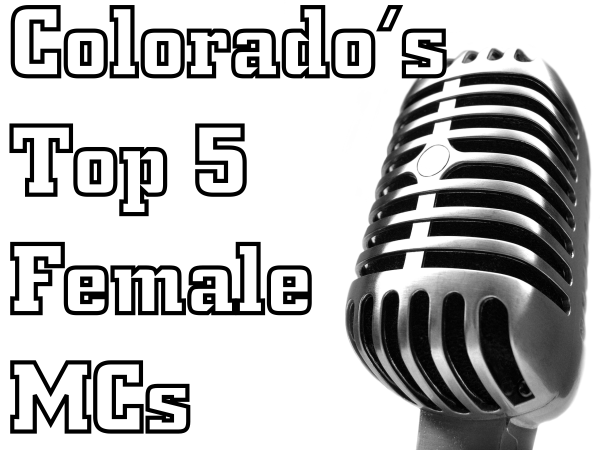 Well the same doesn’t go for female MCs, especially in Colorado. There’s definitely a shortage in our state, and maybe the same can be said for mainstream hip-hop as well. What happened to the all the MC Lytes, Queen Latifahs, Left Eyes, Lil Kims, Da’Brats, Missy Elliots? I’m sure you can list more, but isn’t it strange that, let’s be honest, the record labels all of a sudden stopped supplying us with a multitude of Female MCs to choose from? No diss to Ms. Minaj & Kreayshawn, but I’m sure there has to be a lot more talented and influential women out there worthy of our ears and our money. Well Colorado is lucky to have these 5 ladies below repping for us as well as female emcees everywhere. These ladies stood out for various reasons, and we’d like you to take a few minutes to get yourself acquainted. Click on their names to find out more about them if you’d like. Lily Fangz of Welcome to the Dope Game, first came on our radar at Ru Black and Lizzy Brodie’s Final Friday Rap-A-Thon series last fall. She came, she dropped some fire, then she left. Despite her early departure from the cypher, her flow was on point enough to leave an impression and have us asking what her name was, and where we could find out more about her. She’s doing big things having recently opened up for Red & Meth on 4/20, as well as snagging an opening slot for Feed The Rocks with Nas and School Boy Q. Not to mention the countless other shows she has done and will do in the future. Keep her on your radar! LPeez is nothing less of remarkable when it comes to her lyrical persuasiveness. Her flow will have you believing she’s been in the rap game for decades perfecting her delivery. She’s definitely a candidate for stardom under the right conditions. Aja is the truth. Along side her husband, who together make up The Reminders. She accounts for one whole dose of female dopeness. If the people, and not the record labels made the decision of who in the music world we would want our daughters to idolize, it would be Aja. If you have an opportunity to see her perform live…Do It! A’Dula is raw. Her lyrics might hurt your feelings, or at the very least offend you. She’s hungry too. She’s on her way to the top, and from our point of view there’s not much in her way either. Once she gains momentum, you’ll be seeing a lot more of her around the city. Who else should be on this list? Comment below! How can this list not include the former bandwagon winner and root 40 preformer at the fillmore Qbala!